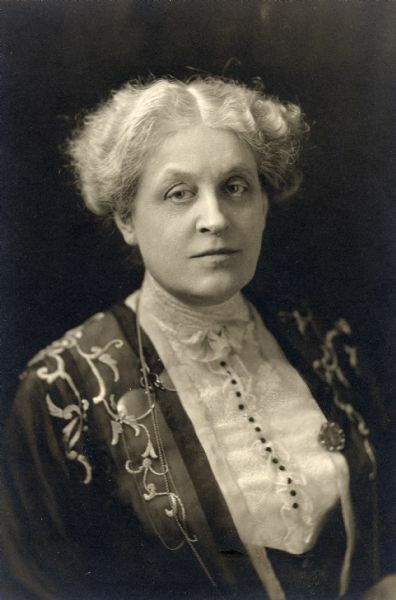 Carrie Chapman Catt was a well-known orator, political organizer, suffragette and advocate for world peace. 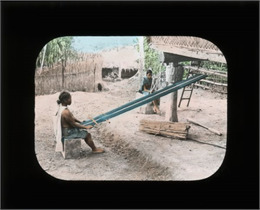 This gallery consists of 100 hand-colored glass lantern slides from her travels to Asia, Africa and the Pacific Island region. Additionally, several portraits of Carrie Chapman Catt are included. Many of the images capture daily life and social issues in the countries that she visited such as poverty, marginalization, intensive labor and low wages while others are simply images of landscapes, buildings, people or animals. Throughout the gallery, excerpts from her travel journals have been utilized to aid in the description of the images. 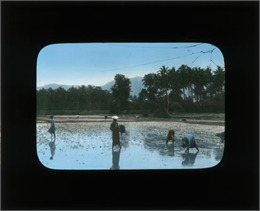 Workers Planting in Rice Field, 1910 ca. Lantern slides, introduced in the mid-1800s, are an image format that was produced by developing a negative using light-sensitive glass. The final product is called a slide and could be tinted, or "colored." The majority of the images in this gallery have been colored. Because it was, at the time, fairly common to purchase images during one's travels, it is unclear which images were taken by Carrie and her travel companions, and which were purchased. Carrie does make reference to taking photographs, buying photographs and ordering photographs throughout her travel journals. Carrie Chapman Catt started her career of public speaking in an Iowa chapter of the National American Woman's Suffrage Association (NWSA) around 1890. She retained this position and went on numerous speaking tours to lecture on the issue of suffrage until she became president of NWSA in 1900. In this capacity she continued to speak, tour, and also turned her focus to international suffrage, a pursuit she would follow for the rest of her life. She gathered information on women's legal, social, industrial, educational, religious and political status from thirty two countries between 1900 and 1902 with the hopes of establishing an international suffrage organization. As a result of her efforts, the International Woman's Suffrage Alliance (IWSA) was founded in Washington, D.C. in 1902 at the 34th annual NAWSA convention. This organization became her focus after she stepped down as president of NAWSA in 1904, though she remained active in the organization. In July of 1911, Carrie began a tour to Asia and Africa for IWSA. She traveled to Ceylon (now Sri Lanka), South Africa, the Sudan, Java, the Philippines, China, Japan, South Korea, Palestine and India in an effort to establish further chapters, partnerships or affiliations for IWSA. She spoke to groups of women, existing organizations and political entities to champion the issue of suffrage and overall betterment of the place of women in society. She returned from this trip in November, 1912. She continued to be politically active in organizations for suffrage and world peace until her death in 1947. 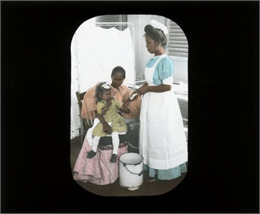 Nurse with Young Girl and Mother, 1910 ca. Carrie Chapman Catt was born Carrie Clinton Lane on January 9th, 1859 in Ripon, Wisconsin, to Lucius and Maria Clinton Lane. She gained an early interest in feminism from her mother who had attended Oread Collegiate Institute in Massachusetts which was a major feminist center at the time. At the age of 7, her family moved to Charles City, Iowa. Carrie attended Iowa State Agricultural College beginning in 1877 and was an active student. She earned her tuition by teaching at country schools during breaks. She started the Ladies Military Company, better known as G-Company, which was a women's drill team. She also aided in changing the policy of Crescent Literary Society so that women could debate rather than just do literary recitations. When Carrie graduated in 1880, she was the only woman in her class. She earned her degree in the General Science Course for Women and moved to Mason City, Iowa to teach high school. She soon became the school principal and superintendent. It was here that she met her first husband, Leo Chapman, who had purchased one of the town's newspapers, "The Republican." After their marriage she served as his co-editor and started a weekly feature, Woman's World, which discussed the position of women and suffrage. The couple made the decision to move to California. Leo was to go first, and Carrie was to follow. However, Leo died of typhoid fever while Carrie was on her way. Carrie stayed in California for a couple of years doing freelance journalism until she married George Catt in 1890. Carrie moved back to her home in Charles City and became a public speaker for the Iowa chapter of the National American Woman's Suffrage Association (NAWSA), later becoming president. Women using Loom, 1910 ca. With the passing of the 19th amendment in 1920, NAWSA became the League of Women Voters and turned their attention to social legislation. Carrie's attention remained on international affairs. She organized the Conference on the Cause and Cure of War and in the years leading up to World War II, rallied support for the World Court. Throughout her life she continued to speak, write, and travel for suffrage, the advancement of women, and world peace. Note: Carrie Chapman Catt's diaries and photos are available at the Wisconsin Historical Society Archives Reading Room. See more information about visiting the Library and Archives. View the Arcat listing for the Carrie Chapman Catt diaries and photographs.